Vazhakkai podimas/ Raw banana podimas/ Plantain podimas is a simple and interesting side dish for rice. In my house, we make podimas with potato usually. This time, I prepared podimas recipe with vazhakkai just for a change. We call it as Valakkai puttu. Both mom and MIL follow the same recipe. The key to make perfect raw banana podimas lies in the cooking of plantain. Every time I used to cook the plantain in a closed kadai or in an idli steamer but it takes more time to cook. So this time,I pressure cooked the raw banana with skin for just one whistle in high flame. It was cooked perfectly. 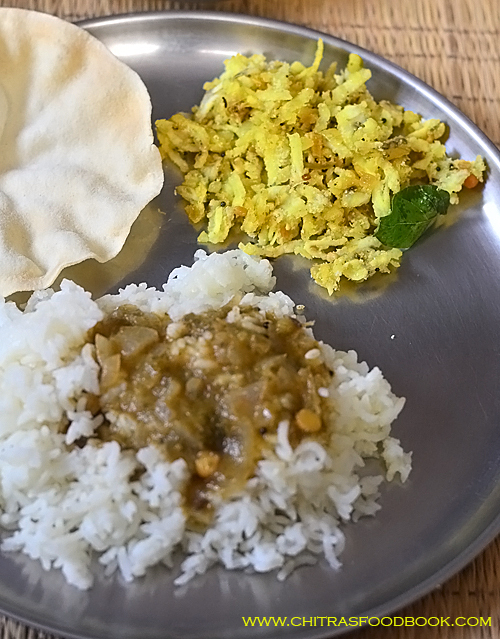 Addition of more coconut is the second important point to make tasty podimas. I have discussed all these points in detail below. 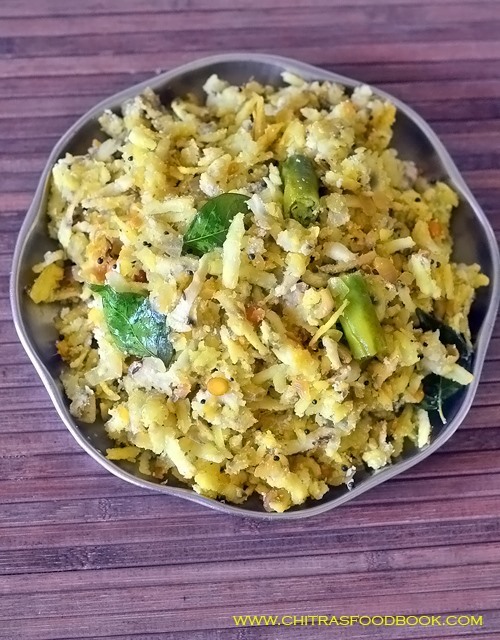 Friends, do check out this post and try this easy, yummy vazhakkai podimas at home. 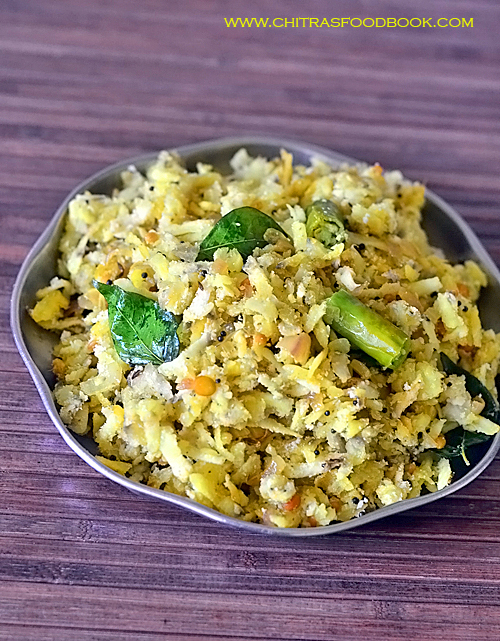 You can have this as a side dish for sambar rice, vatha kuzhambu rice and even with some spicy rasam rice. Ok, Lets see how to make Tamil nadu special side dish raw banana podimas/ vazhakkai puttu with step by step pictures. 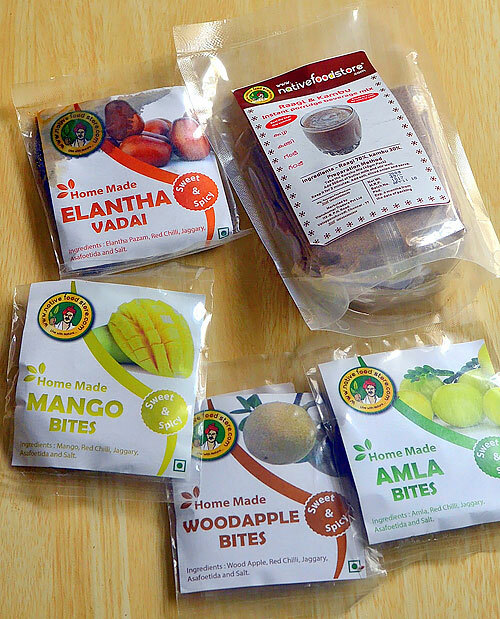 Recently I got a collection of fruit bites and a pack of Ragi, Kambu Koozh from Native Food Store. My family is a big fan of their readymade products. I have already tried thier millet pongal mix, Instant millet noodles, millets, cold pressed oils (Chekku ennai). We loved everything. This fruit bites is their recently launched product. They sent me few samples for taste & review them. I was so excited to see my favorite elandha vadai & tasted it first. It was so good and homely but I felt the seeds are more. Mango , woodapple and amla bites were tasty and bit spicy. Its really a healthy choice for snacks. We loved it very much. Price is also reasonable. Friends, do try their readymade food products from Native food store online. You will love it for sure👍. South Indian special, Tamil nadu style Vazhakkai podimas / Raw banana podimas for rice. Wash and pressure cook raw banana / Vazhakkai in high flame for one whistle. Raw banana should be 3/4 th cooked. Remove the skin and grate it using a bigger grater. Temper all the ingredients given above. Saute onion, green chilli, curry leaves and ginger. Add the grated vazhakkai, salt and turmeric powder. Mix gently. Lastly add grated coconut, toss well and switch off the flame. Enjoy with sambar rice! Wash and cut the raw banana (Vazhakkai) into two pieces. Take 1.5 cups of water in a pressure cooker base and add the vazhakkai. Cook in high flame for one whistle. Remove the lid after steam is released. Peel the skin of raw banana. Wash it under tap water to cool down the raw banana. Grate it using big sized grater. Set aside. Chop onion, green chilli, ginger and curry leaves. Heat oil in a kadai. Splutter mustard seeds, urad dal, chana dal, cumin seeds. Saute onion, green chilli, ginger and curry leaves. Add grated raw banana. Mix gently. Lastly add grated coconut, mix well and switch off the flame. For variations, you can use red chilli instead of green chilli. If you like masala flavor, you can try adding red chilli pwd, dhania powder and garam masala powder. Try this easy, yummy raw banana podimas with rice and enjoy ! Thank you Chitra for your review and feedback of our newly launched products. We appreciate your efforts to try new and innovative recipes with your own twist.Thanks for your support once again 👍.